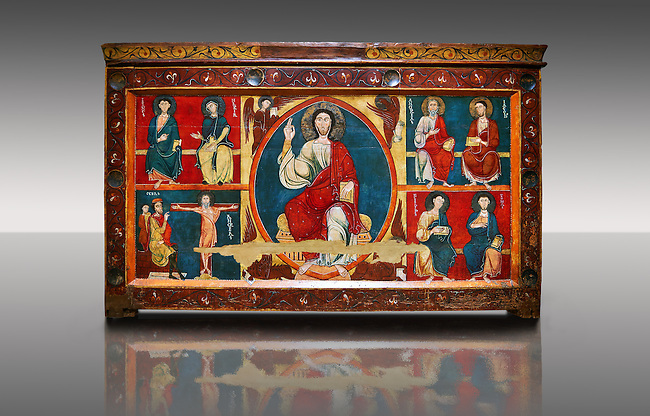 Around 1200, Tempera on wood with metalic ornamention from the church of Saint Andreu (Andrew) of Baltarga, Catalonia, Spain. The Romanesque paintings depict scenes from the life and the martyrdom of St. Andrew. At its centre is a theophany with Christ Pantocrator (Majesty) surrounded by a Mandorla around which is a tetramorph with the symbols of the four evangelists, St Matthew the man, St Mark the lion, St Luke the ox, and John the eagle.. Eastern influences are especially evident in this magnificent altar frontal, which has an elegant palette of colours, with sophisticated soft flesh tones. The work seems most likely to have come from the workshop of highly skilled Greek painters, which was installed in the vicinity of the monastery of Sant Marti Canigo and signed at least one of their works (now defunct) as Magister Alexander.